William Morrow Paperbacks, 9780062283054, 400pp. 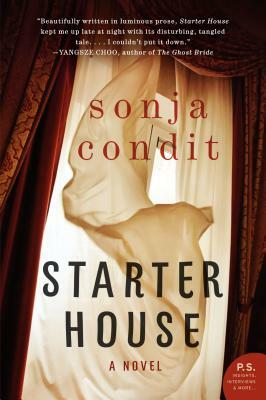 Promising talent Sonja Condit makes her debut with Starter House, an eerie and mesmerizing tale about a young couple whose new house holds deadly secrets from the past, sure to appeal to fans of Heart-Shaped Box and The Thirteenth Tale. From the moment Lacey sees the house with the beautiful wood staircase, she knows she’s found her dream home. Growing up rootless with her flighty mother, Ella Dane, a self-proclaimed psychic, Lacey is determined to give her unborn baby the stability she never had. But shortly after she and her husband, Eric, move in, the warm and welcoming house becomes cold and dark. There is something malevolent within these walls that wants to hurt her unborn child—a terrifying presence that only she can sense. And there is Drew, a demanding and temperamental little boy who mysteriously appears when Lacey is alone. To protect her unborn child and save her family, Lacy must discover the truth about her dream house and the troubled Drew—a decades-old mystery involving secrets, violence, and guilt—and confront an evil that has lingered in wait for years. Sonja Condit received her MFA from Converse College, where she studied with Robert Olmstead, Leslie Pietrzyk, R. T. Smith, and Marlin Barton. Her short fiction has appeared in Shenandoah magazine, among other publications. She plays principal bassoon in the Hendersonville Symphony Orchestra and the Greater Anderson Musical Arts Consortium. She teaches at the South Carolina Governor's School for the Arts and Humanities.